As I mentioned earlier in my posts that I love Crabs. Whenever I find some fresh crabs in the fish stalls, I never miss to buy it. Traditional dish Crab Masala is already in my blog. This was the first time I actually experimented with Crabs and that was Schezwan Crab and I am glad to say it turned out GREAT. Still I am drooling while writing this post. Its so simple and gets ready in minutes. 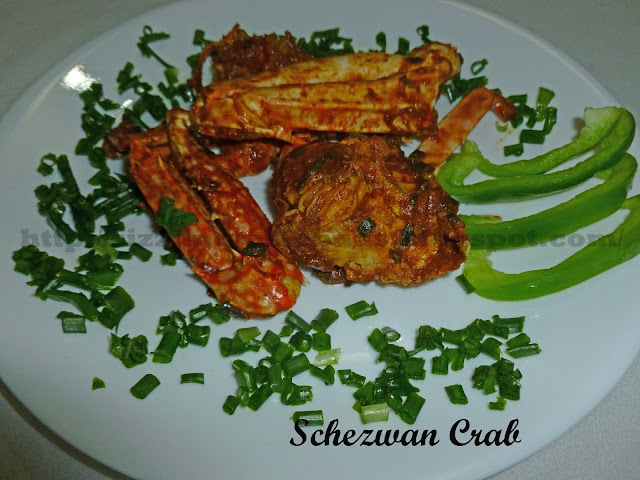 So here's a quick and mouth watering Chinese recipe- Schezwan Crab. 1. Clean the crab and keep aside. 2. Heat 2-3 tsp of vegetable oil in a pan. Add one onion finely chopped. Fry it till it turns translucent. 4. Add Cleaned Crabs and pour little water. Close the lid and allow it to cook for about 5- 6 mins in medium flame. 5. Now add red chilli powder,dhania powder, ajjinamotto and salt. Mix well and cook it till the crabs are almost cooked. 6. Add all the sauces, mix well and cook till crabs are done. Pour corn flour dissloved in water to thicken the sauce. 7. Garnish with finely chopped spring onions. Try it and let me know how it tasted. wow ...schezwan crab looks yummy & tempting..